Yesterday we explored how the state of today's Social Media tools may be turning off some Social Networkers. I suggested that the future of Social Media cannot be assessed based on today's immature tools but must be viewed in the context of the concepts and tools that will revolutionize personal communication in the years to come. So what might the future look like? It certainly won't be the jumble of independent, overlapping, and unreliable tools that we have today. Let's imagine a Social Media future and then consider how we might take actions now that will better prepare us for this future. The year is 2021. You park your flying car and arrive at a street with three unfamiliar restaurants. At which should you dine? Back in 2008, you'd have gambled and selected one based on its name, signage, or appearance; but here in 2012 you've just been fitted with the latest in contact lens displays. Within moments, you are provided with just the information you want because your personal, portable, and essentially invisible computer knows exactly the data to extract and provide for your consideration. You may care that one restaurant was rated best overall, another was rated most romantic, and the third was rated best for families. Or perhaps you care about service a great deal, so you are provided with past diners' ratings of the waitstaff for the three restaurants. 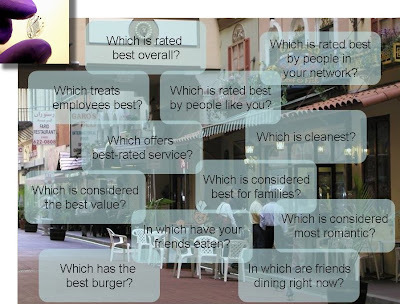 You can even access data from your network of friends to learn which one is rated best by the people you know, and in doing so may discover a couple of friends are presently dining in one of the restaurants. Based on the objective feedback and information culled from others, you can make an informed selection using the criteria you most value. If this is the prospect we face--Social Media ever present and integrated into consumers' daily lives--how might we prepare today? If it seems too soon to prepare for this Minority Report-like future, consider what you and your organization might have done in 1995 to prepare for the Internet of 2008; what advantages could you have gained and which mistakes might have been avoided? I believe there are two broad categories of actions that marketers should take now to pave the road to future Social Media success. The first is to execute the traditional best practices that create and strengthen brands. The second is to begin to embrace the new era of Social Media and create relationships by engaging consumers. A strong brand will be perceived better and thus generate more positive Word of Mouth; in addition, stronger brands will be less affected by negative Word of Mouth. If today your brand is not a strong brand--the kind of brand that people would miss if it were gone tomorrow--you have two choices to prepare for the changes ubiquitous Social Media will bring. You can continue to be one choice among many and constantly struggle to keep up with shifting consumer tastes and competitive offerings. Or you can create a brand to which consumers feel affinity beyond the value of your price, services, and product features. Build your brand with emotion: Based on the restaurant example, it may be tempting to think that consumer decisions in the future will be based purely on fact and logic, but successful brands have always found a way to appeal to the right brain as much as the left. The growth of Social Media will make it more important than ever to nurture a brand that creates emotional bonds with consumers. Last week we revisited the famous story of New Coke. Even though studies conclusively demonstrated consumers preferred the taste of New Coke over the original recipe, people still rebelled against the new product and forced the return of Original Coke. The lesson? Humans are emotional creatures and no matter how much we may wish to believe our decisions are made on fact and logic, the truth is that emotion trumps reason. Social Media will especially threaten those brands that lack an emotional connection and instead compete solely on low price, product features, or execution. Maintain your knowledge of what consumers want: A common problem for brands is marketing myopia; most of us in business consider ourselves experts on our own products and consumers, and we become pretty convinced that we understand what consumers want. Business textbooks are full of examples to the contrary, but the lessons we learned as students are quickly forgotten in a business environment that values decisiveness, fast results, knowledge, and experience. Knowing that many organizations do not gather sufficient intelligence from and about consumers, now would be a good time to assess and improve your consumer research. In a hyper-competitive and transparent world, the brand that understands consumer wants and needs will be best suited to meet them. Create a unique position: In our restaurant example, there is room on the street for many restaurants to succeed, provided they serve different needs. One can provide a romantic experience while another may offer the right venue for family dining, but in a future where brands cannot hide from the positive or negative opinions of its customers, there is no room for an establishment that attempts to do both and fails. The key isn't to be the best-rated restaurant on the street (although it doesn't hurt) but to be the best-rated for a certain need state and consumer. Create memorable experiences: For some low-engagement brands, the best experience is simply that the product delivers on its promise every time. For other brands, delivering consistent positive experiences can help create affinity while providing excellent experiences can turn affinity into influence in Social Media. Creating a memorable experience can be done in many ways. It might be proactive service offered via Social Networks. Or marketing that doesn't interrupt consumers but instead enhances their lives. Or hiring and training employees who convey the brand and a superior level of service at every touchpoint. Or violating consumer expectations in an unexpected and delightful way. Or, perhaps it is all of the above, because in a transparent world, the experiences you create will either make or break your reputation and your brand. Monitor Social Media: The importance of maintaining consumer knowledge was noted above, and Social Media provides new ways for brands to gather intelligence. According to AdAge.com, brands such as P&G and Unilever are leveraging the power of Social Media for research purposes. Some brands will create private networks, but you don't need to launch an expensive customer network (a la My Starbucks Idea) in order to listen to consumers. Tools such as Twitter search, Technorati Search, and Google Blog Search furnish a means to hear consumer rants and raves right now. Step away from the blog and engage consumers where they are: Blogs are a fine Social Media tactic, but in many ways they aren't that different from typical Web sites--blogs offer content provided by the brand within the brand's own private and branded domain. Consumers will rarely feel able to share their honest feedback within sponsored blogs, and frequently if negative opinions are conveyed these are deleted or omitted by moderators. A glance at Brian Solis's brilliant Conversation Prism demonstrates that blogs are just a small portion of the Social Media realm, and as Social Media grows the vast majority of consumer dialog will occur outside of blogs. It isn't too early for brands to be part of social networks (Facebook and MySpace are already popular for marketers) and Microcontent tools (of which Twitter leads the pack) and to begin testing the waters of social documents, pictures, video, service networks, and the like. Communicate the brand internally: Social Media will require more employees to communicate with larger groups of consumers than in the past. Controlling the message and conveying a consistent brand will be very challenging with so many people representing your brand across a variety of channels. Now is the time to make sure those within your organization understand what makes your brand different, the personality it wishes to convey, and the ways its voice can be communicated in Social Media. Social Media will bring many opportunities and challenges as it evolves in the coming years, but it's never too early to concentrate on marketing fundamentals while testing the ever-changing tactics made possible by Social Media. You could wait to see what happens to Social Media and to your brand, but it might be worthwhile to consider Jeff Bezos. Bezos recognized the changes the Internet was bringing to business and launched his online media store two years before long-established powerhouses Barnes & Noble and Borders. Today, Bezos is worth $4.3 billion while the combined market capitalization of B&N and Borders is less than $2 billion. Brands don't need to be on the bleeding edge--after all, Bezos wasn't the first to sell books online--but brands that proceed too slowly will be missing opportunities and threats as Social Media becomes more intuitive, more common across consumer groups, and more powerful in shaping consumer perception and actions. 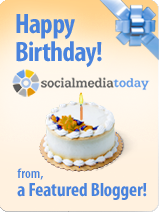 It is the first birthday for Social Media Today, one of the most consistently readable and interesting sites about the Social changes that are coming to business. I am honored to be among the bright bloggers who contribute to SocialMediaToday.com. If you are unfamiliar with the site, please visit Social Media Today and register. If you enjoy ExperienceTheBlog.com, you'll certainly find the content at Social Media Today relevant and worthwhile. Word of Mouth Marketing blog Buzz Canuck created a list of the top bloggers from the USA (and a second list of International bloggers) who "speak on the subject of word of mouth, viral, buzz, influence and the engaging brand." I was very honored to be included in the list, which is comprised of many blogs that I read and many bloggers whom I respect a great deal. Sean Moffitt selected bloggers who have "distinguished themselves by helping visitors understand how ideas spread, online and offline, through a range of different strategies and tactics... Each recognizes the importance of having brands getting noticed, talked about and advocated in a 2.0 world." The list is a terrific one, comprised of some of the best reading material you can find online on the topic of Social Media. Be sure to visit Buzz Canuck to see his list of top blogs! My thanks to Sean for including ExperienceTheBlog.com! In the past few weeks, we've explored a number of issues relating to the law and Social Media. In a post entitled "Social Media, the Law, and the Court of Public Opinion," it was noted that "brands must become cognizant that the law provides no refuge from public opinion when graceless legal actions are taken." Whether the Recording Industry Association of America's (RIAA) actions with respect to file sharers has been graceless or not is perhaps a matter of opinion. One thing seems clear to me, however: The RIAA is attacking the problem as a legal predicament when the root of the issue has everything to do with consumer perception, communication, and marketing. My viewpoint about music file sharing has tended to be far more sympathetic toward record companies than the vast majority of people. I believe that no amount of hatred of current record distribution systems justifies theft or the reduction of revenue to artists, technicians, producers, recording studios, marketers, and the host of people whose livelihoods rely on music sales. That said, it is hard not to feel that the RIAA has been clumsy in its use of the law against file sharers. According to Wired, the RIAA's "massive litigation campaign... now includes more than 30,000 lawsuits targeting alleged copyright scofflaws on peer-to-peer networks. The targets include the elderly, students, children and even the dead." The RIAA has been proven right on this matter in court--in a decision that may yet be reversed--but that hasn't benefited their cause at all. As Wired notes, "Despite the crackdown, billions of copies of copyrighted songs are now changing hands each year on file sharing services. Some are wondering if the campaign has shaped up as an utter failure." It really should come as no surprise that the RIAA's litigation has had little effect on the problem. Not much has been done by way of communications, and legal approaches aren't likely to be successful in the interconnected and distributed world of Social Media. File sharing is, after all, a form of Social Media--one that can be used for very appropriate or very inappropriate means. There is no question, even among the RIAA's most vocal detractors, that file sharing violates intellectual property protection at some level, so why is this situation so difficult for the music industry? Many argue that the industry must change and that it hasn't adapted to the age of digital music. I can't argue that line of reasoning, but I am not convinced that is ultimately the problem. After all, someone has to be responsible for covering the costs of recording and marketing for upcoming artists. If not record companies, then some other entity will play a similar role, promoting and sponsoring musicians in a way that provides profits to those involved with the creation and distribution of recorded music. To me the problem is--as it often is--a communications issue. All that money spent on suing college students hasn't convinced people that records companies are important and viable. The RIAA's own actions have, in fact, encouraged the opposite perception: they appear fearful they have no relevance, seem unable to mount a valid case for their own existence, and give the impression they need the law to protect their precarious situation. More lawsuits won't help the RIAA achieve its goals. Nor will raising the rates for Internet broadcasters: In yet another head-scratching move, the RIAA (through partner SoundExchange) convinced the Copyright Royalty Board to raise rates for broadcasting music over the Internet. This has resulted in more bad PR for the music industry as cherished music sites such as Pandora have announced they cannot make money and will have to shutter. More importantly, it seems to work exactly contrary to the RIAA's goals--should legal music sites disappear, there is no question illegal file sharing will increase. It's been five years since the RIAA shifted their attention from suing file-sharing services to suing individuals, and I can't help but wonder if their world might not be considerably improved today if they'd opted for a strategy of communications rather than litigation. What if they existed in a world of transparency and consumers understood the value they bring to the table? What if instead of trying to frighten consumers the RIAA instead made it clear why consumers would want to support the efforts of record companies? As will be learned time and time again, in an age of Social Media--with consumers having more power to communicate, collaborate, and share--winning in the courts but losing in the hearts and minds of consumers will create an unsustainable situation. Suing another 30,000 people will not change the minds of 300 million consumers--at least not the way the RIAA desires. It is well past time for the RIAA to engage consumers so that the purpose and place of record companies may be secured by consumer acceptance and not consumer fear. Forrester's Jeremiah Owyang writes one of the best and most informative blogs on Social Media: Web-Strategist.com. Several months ago he evaluated the Social Media efforts of major brands and was generous enough to share the criteria he used. His post, What makes a Successful Marketing Campaign on Social Networks?, is a very informative read. Owyang highlights many important attributes for Social Media success, such as the ability to scale quickly, fostering member interactions, offering a satisfying user experience, and company participation. The list is excellent, but I think there is an attribute missing: Successful Social Media is placeless. Web 1.0 was largely inseparable from the browser and the PC. The era of the Internet was officially launched with the release of Netscape, and for a decade the most notable advancements were almost entirely browser based, such as Web sites, portals, e-commerce, banner advertising, and search engines. Web 2.0 still uses the browser, but the adoption of Web 2.o will be driven as much by what happens outside the browser as inside, including desktop applications, SMS, mobile applications, voice, passive monitoring, and real world experiences. For a good example of how Social Media is placeless, just look at Twitter, one of the biggest Web 2.0 success stories to date. According to ReadWriteWeb, around half of Twitter users interact with the service on Twitter.com. How do the other half access Twitter? Through desktop applications such as Twhirl, Digsby, and Twitterrific. Through mobile phone applications like Jwitter and Twitteresce. Through widgets such as Tweetahead and TwitThis. Through SecondLife via apps like TwitterBox and SL Messenger. Through geo-location tools such as Brightkite and GPSTwit. Through photo-sharing sites including TwitPic and TwitterPhoto. Through sites that send updates to multiple microblgs simultaneously, such as Ping.fm. By calling a phone number and speaking your desired Tweet on TwitterFone. From Social Bookmarking sites that integrate with tools like Twiggit. Through music sharing applications like TwittyTunes. And from Twitter's Mobile Web site. Thanks to the Twitter API and the ingenuity of developers around the globe, Twitter is everywhere and nowhere. Because of this, Twitter integrates with as many aspects of life as users care to utilize. If all you want to do is Twitter while sitting in front of a PC with a browser open, you can do so; but you may also Tweet a map from the middle of Japan, ask for a menu recommendation while out and about, or share a photo from the slope. Much of the placelessness of Social Media is being driven by new generations of mobile phones with Web access, GPS, cameras, and other features. Mobile Web use in the U.S. is growing by leaps and bounds; Bango reports that the United States will soon surpass the United Kingdom--where people have been surfing the Web on phones for many years--to become the top mobile Web browsing country in the world. According to eMarketer, several recent studies are forecasting tremendous growth in Mobile Social Networking: ABI expects 140 million mobile subscribers worldwide by 2013; Juniper Research estimates that the number of mobile social networking users will rise to around 600 million worldwide by 2012; and Pyramid Research expects even greater growth, projecting 950 million mobile social networking users by 2012. Recipe Site: If your CPG brand launches a site where people can share recipes, why not consider a mobile site where consumers can access those recipes while they shop? Or, how about a feature that permits consumers to select their favorite recipes, enter their cell phone number, and receive an SMS message with a link to their personalized shopping list on a mobile WAP site? Or, why not use a shelf card beside the article that offers mobile access to other consumers' recipes via a texted link? Mall: Here's a perfect idea for a tween-seeking mall: Create a Twitter account and promote the account to young shoppers. Ask them to send an "@" reply to the account whenever they find a great deal. This will permit consumers to share and watch for the best deals while they shop. Social Media that requires a PC and a browser will continue to be the predominant approach for some time, but it's never too soon to think of ways to use Social Media to make connections wherever consumers find themselves. The more brands can create social experiences or provide value away from consumers' computers, the more consumers will integrate the brands into their lives. Do you think there are new avenues now for marketers to competitively position their products against another by starting rumors? Given the ability to spread information in a much faster way, this would seem to be a valuable (and possibly very unethical) method of combating a competitor....but if you can't find or prosecute the source, what is to lose? And, what can the competitor do to provide that "ounce of prevention"? Corporate smearing was a reality well before the advent of Social Media. One of the better known examples is a false rumor that spread widely in the 80s about beer brand Corona; gossip was that Mexican workers urinated into the bottles destined for the United States. While rumors are hard to trace, Corona succeeded in tracking this one back to Luce & Sons, a Reno distributor of competing import, Heineken. Barton Beers, Corona's US partner, sued Luce & Sons and won an out of court settlement requiring Luce to issue a statement promoting that Corona beer was "free of any contamination." While it would seem Corona "won" this case, the power of Word of Mouth is demonstrated by the impact this rumor had on the brand. Even after the case was settled, the rumor lived on; it reportedly took Corona $500,000 (in 1990 dollars) in advertising and PR to repair the damage. Lesson: The Corona/Luce case is a lesson in monitoring Word of Mouth in order to evaluate and execute appropriate action. In many cases, rumors may not be worth the effort and risk of responding, but brands must be vigilant, proactive in their assessments, and ready to respond when necessary. As for the question of whether or not legal recourse is always helpful, let's explore a similar case with McDonald's in the UK. In Britain, McDonald's sued two green activists over criticisms made in leaflets handed out on street corners. The leaflets claimed that McDonald's exploited children in its advertising, were cruel to animals, destroyed rain forests and contributed to Third-World starvation. McDonald's won the case but lost the PR battle. As noted in the Business Times, the case "tied down McDonald's management," cost the company around £10-million in legal fees, and gave a national stage to accusations that previously had been limited to street corner fliers. In the article, McDonald's execs mount an interesting and persuasive case for why the legal effort was necessary, but as one libel expert puts it, "Even if they were completely successful, in these circumstances there will always be residual sympathy for the little guys. It is very unusual for a company to sue individuals. It is a risky strategy." Lesson: In cases when false rumors are spread, we can all sympathize with the desire to find who is responsible, prove them wrong, publicly shame them, and make them pay. Unfortunately, this strategy--regardless of the legal merit--isn't always in the best interest of shareholders. What is in the best interest of the brand is to ensure the false rumors don't stick in the minds of consumers. Almost a century before the Internet, Mark Twain recognized the power of Social Media when he said, "A lie can travel halfway around the world while the truth is putting on its shoes." This adage should be framed on the wall of every PR, marketing, and legal resource in corporate America. The problem with pursuing a legal action isn't the cost, or the potential for loss, or the pulpit you might give your detractors; it's that even if you win, your message won't travel as quickly or as widely as the original falsehood. There is no rule of thumb that can be applied to every case, but as noted in a previous post here on Experience: The Blog, the best defense against false rumors isn't the law; it's communication. If someone says you're destroying the rain forest, tell consumers the many ways you support environmental causes. A battle in court to be proven right may be tempting, but being right doesn't increase sales or stock price; winning the battle for the mind of the consumer is the only battle that matters. It is enticing to think that blatantly ridiculous rumors will simply fade away and are best left unanswered. Be aware this approach may be a little too tempting, as Snapple learned. In the early 90s, rumors began circulating that Snapple was associated with the KKK. Snapple decided not to respond immediately. Leonard Marsh, the company's president, said the rumors were, "so ridiculous we thought they would go away, but they didn't. It reached the point it was getting out of hand and we had to address it." The company eventually launched an ad campaign directly refuting the rumors, and the three co-founders appeared on MTV to get the truth out. The company took further steps to fight the rumors. The gossip claimed an illustration of a ship on the Snapple label was a slave boat and that a small "K" on the label represented the KKK. Snapple redesigned their bottle to make clear the ship represented the Boston Tea Party and the "K" was enhanced with the words "kosher pareve." Lesson: Don't be afraid to act, and don't think the only response mechanism is PR and advertising. Remember that the product itself and its packaging might be used to combat misinformation. Snapple came to feel they waited too long to fight the rumors, and their willingness to change the product packaging helped to make the gossipers look ridiculous and erroneous. Another thing to note about the Snapple incident is that the company's efforts to find the source of the rumors were unsuccessful. This is pure speculation on my part, but I wonder if locating the source of misinformation might actually encourage the wrong response. Corona found the source, sued, and secured a public statement, but the rumors persisted and forced the company to further action; Snapple couldn't find the source of the rumor and instead took their case directly to consumers through PR and packaging alterations. Perhaps Corona might have been more immediately successful by securing third-party tests of their product and adding an objective seal of purity and quality to their bottles. Another famous example of corporate smearing dates back to the late 80s. American Express was caught spreading false stories tying rival financier Edmond Safra to money-laundering, organized crime and the Iran-Contra affair. Safra sued, and even though there was a question that some of stories may have been true, American Express felt they were better served avoiding the bad PR and court costs, so they agreed to donate $8-million to charities chosen by Safra. Lesson: Spreading rumors can easily turn out as bad for the spreader as the target. This is especially important to consider in the age of social media, when employees may independently share rumors or misinformation that reaches a wide audience. With the stakes so high, don't assume your employees know the rules; have a strong ethics policy and make sure it gets communicated. Because a company's business partners, such as retail sales personnel, distributors, suppliers, wholesalers, and other organizations must do business with other firms, it is essential to maintain trusting relationships with these intermediaries to establish a positive reputation of the company as fair, ethical, and trustworthy. Attempts to plant rumors about competitors, for example, should be clearly prohibited by corporate ethics code. Not only does a company run the risk that its corporate name will ultimate replace the intended rumor target, but it would service to undermine its relationships with other stakeholders once word gets out about its rumor-planting actions. A strong brand is the best defense. A brand that consumers trust and in which they feel involved is less likely to face repercussions from misinformation than brands that start in a weaker position in consumer perception. Monitoring your brand in Social Media is vital. Not every rumor demands a response, but every rumor requires your knowledge, assessment, and ongoing observation. Be prepared for response. Don't wait until a crisis has arrived to consider who is responsible or how you'll act. Have a Social Media crisis plan ready that identifies resources and available actions. Fight for the mind of the consumer. Consider that winning in court may provide little or no benefit, so even if your organization will pursue legal options, that should not stop full and immediate attention to communications. Don't rely on the ultimate outcome of a lawsuit for any benefit in your battle against misinformation. Take the fight to the consumer: As discussed on this blog in the past, you cannot fight a wildfire in Social Media by talking to traditional media. PR to big media can be a tactic you pursue, but should only be one tactic among many. Share valid information in the same social media channels that are being used to disseminate the false accusations. Ensure ethical behavior: Remember that Social Media is giving a megaphone to far more people than in the past, including your employees. The next nasty rumor that circulates in your industry may just come from one of your employees, and the ramifications to the organization could be substantial. Have a strong ethics policy and make sure all employees understand it. And involve your stakeholders, including suppliers and customers, in regular and open efforts to evaluate and enforce corporate ethics policies. As evidenced by the Mark Twain sentiment, rumors and Social Media aren't really new. What is new is the speed and reach of information and interactions. This is why today's Social Media demands attention and care by all organizations. Marketers also need to lose the idea that they have to give up control of brands on the Internet because social media users will do whatever they want with it. It's true that you have less control. But this mantra about giving up control is highly misleading and can actually result in something unintentional... They can end up doing nothing and assuming that it's all good. Frank may be right, but rather than denying or minimizing the power of the consumer in the era of Social Media, why not recognize that consumers have had this power all along? Smart marketers have always known they share control of the brand with consumers. Brands do not exist except in the minds of consumers, so in many respects it may be consumers that have more claim to the brand than do the legal brand owners. For example, several years ago, Wal-Mart announced its "boldest effort yet to target upscale shoppers," but a year later a report from their ad agency was leaked criticizing "Wal-Mart's so-far unsuccessful attempt to climb out of the bargain basement;" among the reasons cited for the failure of the upscale strategy was "customers not thinking of (Wal-Mart) for things like fashion." Today, partially in response to their failure to change consumer perception and partly because of the economy, "Wal-Mart has abandoned its 2002-04 strategy of moving upscale and committed to every day prices for bargain conscious consumers." So, who owned the Wal-Mart brand? The $230 billion company that employs a million people and spends half a billion dollars annually on marketing? Or the tens of millions of consumers who comprise Wal-Mart's customer base? Even before the advent of Social Media, marketers had to work within limits to their brand authority; they couldn't simply make change but instead strove to influence change in consumer perception. Ten years before the Internet went public and two decades before the term "Social Media" became common, one of the world's largest corporations was brought to its knees by the voice of the consumer. In 1985, Coca-Cola was losing market share to Pepsi and was alarmed by taste tests that revealed consumers preferred Pepsi, so the company went in search of a better product. They believed they found their answer in New Coke. What follows is one of the great stories of consumer rebellion in marketing history. After some initial acceptance, consumers mutinied. Many in the south--Coca-Cola's historic stronghold--felt that abandoning the traditional recipe was another step toward losing their culture. The company received 400,000 calls and letters; ads for New Coke were booed in sports venues; talk show hosts mocked the new product; a black market in in overseas "old" Coke thrived; public demonstrations featured bottles being emptied into the streets; sales flattened; and bottlers eventually demanded Coca-Cola reverse its decision and reintroduce the traditional Coke recipe. Coca-Cola didn't stumble blindly into introducing the new product to the marketplace; they actually conducted extensive consumer testing in a secret effort named "Project Kansas." Their tests were conclusive: consumers preferred the taste of New Coke to both Pepsi and Coke. What Coca-Cola--and the rest of the marketing world--learned is that product features are important, but consumers' brand perceptions are even more important. They also learned that it was consumers who really owned brands while marketers are merely trustees responsible for brands' care and management. The point of revisiting the Wal-Mart and Coca-Cola stories is two-fold: First, brands aren't losing control in new ways. The idea that consumers own a share of the brand isn't unprecedented; nor is the fact that consumers can band together and exert influence on companies. What is new in 2008 is the scale of consumer interaction. Social Media is putting the tools and reach of mass media into the hands of individuals. Secondly, both stories demonstrate the need for brands to be responsive to consumer wants and wishes. Wal-Mart and Coca-Cola didn't dig in their heels and assume that their legal title to the brand gave them carte blanche to change it any way they wished. Instead, these two companies retained their market positions by recognizing consumer preferences, admitting failure, and responding in a way that acquiesced to their customers' claims on brand ownership. Brands that fail to respond to shifts in consumer wants and habits will find themselves falling behind brands that listen to and meet those demands. This obvious and unassailable fact is what makes Frank's comment about Social Media inaction so funny and worrisome. He believes the "loss of control" mantra could become so frightening to marketers that they "end up doing nothing and assuming that it's all good." Neither fear nor ignorance will stop Social Media from impacting consumers and brands. Attempting to deny these changes or grasping at justifications for inaction is like closing your eyes and plugging your ears while standing on a railroad track with a train bearing down. Those actions might briefly give one comfort, but they only make the situation worse. In the end, if executives find all the talk of "sharing control in Social Media" frightening, they may wish to consider the alternative: "losing control in Social Media." If you care to see what can happen when a company denies and delays the need to change, look at the classic example of book sellers at the birth of the commercial Internet. In July 1995, an upstart company started selling books online, but giant Barnes and Noble didn't see the same value in the Internet, so it took almost two years to follow suit. In May 1997 BN.com launched and since that date, B&N's stock price is up 24% while Amazon's is up 4573%. The cure for Social Media anxiety isn't to have early adopters and consultants tone down the importance, threats, or opportunities. The best cure is to embrace the coming changes and make them work for you rather than against you, because delays and inaction can be very costly. Update: Well, that was quick. By the time I posted this article about rumor control in Social Media, the McCain/Palin campaign had already acted to control the rumor in question. I had hoped we might learn a bit more about rumor response and management in Social Media by monitoring how this high-profile situation developed, but it seems today's announcement that Bristol Palin is pregnant puts an end to the rumors launched by Daily Kos. As noted in my post, fighting rumors with facts is an obvious way to overcome erroneous gossip, and this is exactly what the Alaskan governor did. In fact, the goal of the announcement was specifically to combat the misinformation; according to the International Herald Tribune, "McCain aides said the announcement about the pregnancy of Palin's daughter, Bristol, was aimed at rebutting Internet rumors that Palin's own youngest son, born in April, was actually the daughter's." While an hour or two made parts of my original post dated, I hope you'll find the rest of it informative. What follows is my original post about the actions a brand or company may take when lies or errors start spreading in Social Networks. Original Post: I've often written on this blog about how Social Media imparts consumers with a bit more control and can permit them to shame companies for actions that may fail to live up to their service promises or brand. My examples to date (such as Wal-Mart's Debbie Shank lawsuit and the Comcast sleeping technician) may have been of arguable importance or relevance but were at least factual: Wal-Mart did sue a badly injured employee to recover medical costs and a Comcast technician did fall asleep in a consumer's home. But what about false rumors? What can a brand do when incorrect news is disseminated through social networks? We'll get some insight into this by observing the Republican response to rumors about VP candidate Sarah Palin and a situation some are calling "Babygate." Since I am largely uninterested in the rumors themselves, I won't delve into them other than to say a liberal blogger, DailyKos, has compiled hints and gossip that he believes suggests Sarah Palin's youngest child is really her daughter's child. The litany of innuendo includes photos of Sarah Palin during the pregnancy, photos of her daughter Bristol (who the blogger claims is the real mother), and details about Sarah's flight from Dallas to Alaska after her water broke. In our highly charged political environment, it is probably no surprise that this rumor started spreading. First shared on DailyKos on August 30th, the tale traveled quickly. Two days later (during a long holiday weekend and with news media focused on a major storm bearing down on the Gulf coast), Google reported almost 12,000 hits for the search term "Palin Babygate." As of Monday morning, roughly one-quarter of the Tweets and three of the top four Digged links containing "Sarah Palin" were focused on the baby rumors. Over on YouTube, videos are starting to appear, including one that has been viewed over 22,000 times in the first 24 hours following its upload. No mainstream media has yet reported on the gossip, but you'd expect there's a rush to either confirm or deny the stories at this time. So, what should the Republican party do? "Lawyering up" is not out of the question, but intimidation is rarely a very good idea nor is it typically successful within Social Media. A cease and desist letter may put the fear of financial repercussions into the hearts of some bloggers, but in the widely distributed world of Social Media, once a rumor is released into the wild, it is impossible to contain. Plus, unleashing the lawyers will upset and anger friends and invigorate most foes. Don't respond (directly) when rumors are unimportant: For rumors that won't have a significant impact on brand perception but are still bothersome, it may be best to do nothing other than to seek positive associations. Rather than roll out the big guns to combat the negative gossip, you can overcome negative Word of Mouth with a strategy to inundate the bad news with good. Carefully selecting the right message--one that reflects the spreading gossip--and broadcasting that message can permit you to fight the rumors without directly addressing them. This is a tempting approach because it allows the brand to stay above the fray, but it cannot be successful in the face of consequential bad publicity spreading like wildfire through Social Networks. Solicit support from your network: Fighting rumors should not be a solo effort. Don't be afraid to recruit people in your network to assist. Arm them with the talking points and facts, let them know about your shared interests, and request their assistance to get the word out. Don't tell them what to do, but be sure they are made aware of the importance of broadcasting the truth and responding to misinformation. Tailor your attitude for the channel: When faced with dishonesty or mistakes, it is hard to contain righteousness and indignation, but this is probably not the best attitude. In press releases, you should leave no question as to your commitment to fight the rumors, but anger and frustration have no place. When reaching out to friendly bloggers, treat them as independent allies and not as cogs in your PR machine. And when reaching out to combative bloggers, a mild approach is recommended: inform them they are wrong, offer the facts, state the actions you'd like them to take, and--without threatening--end by expressing the hope you can secure their commitment without additional recourse. Use facts to fight falsehood: It goes without saying the best defense is a good offense. If you possess facts that prove the gossip is objectively incorrect, get that information out in every channel. Since rumors tend to get stripped of detail when passed from one person to the next, using facts allows you to fill the gaps in people's understanding. Links to objective third-party sources will be worth more than links to your own Web site. Advertise: Advertising has traditionally been thought of as a means to fight only the most threatening of rumors, but online this tactic makes sense in just about every case. For example, search engine advertising provides an excellent and instantaneous channel to reach people as they are searching for information about a scandal. Your contextual ads can appear above and beside any search engine results containing lies and mistakes. Launch a site: For very damaging rumors, launch a Web site with content singularly focused on changing the minds of visitors. With a careful link-building strategy that includes links from official brand and company sites and from friendly blogs and social networks, your site can attain great organic search engine relevance which can help increase traffic and disseminate appropriate information. Watch for errors and lies on objective sites: Monitor your Wikipedia entry and other publicly-maintained sites to make sure information remains accurate. Remember that your actions may speak louder than your information; deleting an uncomplimentary reference on Wikipedia may appear overly defensive and could be viewed as censorship. In some cases, it may be best to edit such entries to tell your story rather than delete it and turn your actions into additional grist for the rumor mill. But if there is any truth to the rumors... It is very important that if there is so much as a shred of truth to the rumors, this can and should have a profound impact on your response. Admitting which portion of the rumors are accurate is vitally important, since consumers who learn this themselves at a later date will be left with a lot less trust in you and your brand. If significant portions of the rumor are both truthful and not, lead with an apology, briefly explain but not excuse the situation, then move on to addressing the incorrect portions of the rumors. In an election year and with the broad reach of negative gossip on blogs, I'd suggest a more proactive course of action. The McCain campaign could end up playing defense later because they didn't get assertive quickly, but time will tell. As of now, Palin's page on the McCain site contains only her official comments after being selected for the VP slot, and the McCain news page has not been updated in three days. Palin. John McCain's VP Choice! The fact the link takes Web surfers to a page with no rumor control or information may be a mistake, since those who click on such an ad are obviously seeking something the McCain site is not providing. They could end up with the worst of all worlds: They'll pay for clicks that won't provide benefits while giving some credibility to the rumors; after all, the campaign is sufficiently aware of the rumors to buy an ad that references them, but the site gives the impression McCain and Palin are unable to fight the rumors with facts. Of course, with all this occurring over a holiday weekend and on the eve of the GOP convention, it could be that more substantial PR management is planned for early in the week. Observing how this situation shapes up in the coming weeks will provide some key lessons for those of us tracking the changing Social Media landscape. This could become an excellent case study for how to combat lies and misinformation in Social Media--one way or the other.